The interaction between Japan and Brazil has been promoted through immigration. However, not only has it given advantage but has also caused new problems. Which issues needs to be solved first? One of the most critical problems would be education. This is because children are the ones who will make the world of tomorrow; therefore, their educational problems should be a priority matter for creating a better future between Japan and Brazil. The main purpose of Japanese education in Brazil is to prevent children from forgetting their roots and identity as Japanese. It is also beneficial to those who will eventually return to Japan and build their career there. The first Japanese school in Brazil was Taisho Elementary School, established in 1951. Now it is estimated that there are 16,533 students learning at 434 Japanese schools (Tajiri). The majority of schools are in the states of São Paulo and Paraná, and students are now mostly third-generation. Centro Brasileiro de Língua Japonesa (The Brazilian Center for Japanese language) intends to improve the Japanese ability of Nikkei people. It operates various training sessions and events for both adults and children, and one of its main roles is to operate the Japanese juvenile examinations for young people. The examination has taken place in September since 1999 to encourage Japanese learners. However, the rare use of Japanese outside of school and low ability of reading and writing Japanese are considered as severe problems. Language education of children could not be completed without parents’ cooperation. Not only children but also parents should create more opportunity to use the language regularly, so that it will permeate into their lives and identities. Brazilian education in Japan is either at Japanese public schools or Brazilian schools. The former is preferable for a family that intends to stay in Japan for the long term, while the latter is for a family that will eventually return to Brazil. At public school, in most cases only Japanese language and social studies are taught separately from native Japanese. Since it is cheaper than other types of school, it is considered as the best choice financially. However, once entering a public school, immigrants often face difficulties of communicating with classmates and teachers because of the language difference. There is also the awareness that Japanese-Brazilians might be discriminated against for low Japanese language ability in spite of their Japanese-like appearance. Wada Junior High School in Yaizu, Shizuoka had three Brazilian freshmen in 2007. The principal confessed, “Already one student of class 06 quit. The main reasons for Brazilian students’ leaving are due to friendship and language problems.” He added, “Although I want to talk to their parents, they are out at work all day long, so making contact is not easy” (Sugiyama, 46). A school in Toyota, Aichi, is eager in helping foreign students. The principal said that he considers them the same as Japanese students and is making efforts to realize better learning conditions. There are 50 foreign students out of 340, and two Japanese language teachers and three Portuguese-speaking teachers assist them. The school cooperates with a volunteer association to help home learning. As a result, almost 80% of them go on to junior high school (Sugiyama, 78). Such profound support enables children to continue their school life, but carrying it out requires economic back up and a highly motivated environment. Another choice is Brazilian schools, but they are quite expensive. There are not enough facilities and teachers who are proficient in Portuguese, so that a certain quality of education is not assured. In addition, Brazilian schools are considered as private cram schools in Japan, although they are admitted as valid for an educational career in Brazil. Therefore, continuation of career would be difficult depending on which type of school is attended. Tadashi Yamamoto, a second-generation Japanese-Brazilian man with two sons, points out the problem based on his experience. He works at Toyota America, and he has been in Japan since 2006. His sons went to a German International School in Brazil when they were four years old. He could have taken them to a Japanese school, but “There was no Japanese school for that early age. Its educational quality was not good either. So, I chose a way to educate them to a certain quality regardless of language”, he said. He recalled that half of the students at that international school were German, while the other half was Brazilian. “Germans were smart. They established the school to educate people who would more likely work at a German company in the future. They considered it as effective investment. Everything is about business. At that time Japan had a lack of sense of international business, and it might do still”, he presumed. His children moved from Brazil to the United States when he resided there. They continued to attend international school. There were some Japanese schools, but there seemed to be no benefit when thinking of their career back in Brazil. Now it has been three years since they moved to Japan. Their mother tongue is English due to their education at international school from an early age. Mr. Yamamoto says, “They sometimes have difficulty of talking with me in Portuguese, because they do not know much vocabulary. I intend to communicate with my sons in Portuguese as much as possible, but it does not always work out”. Their language ability in Japanese is extremely low. “I wanted them to know Japanese as a part of their roots and identity, but all their friends are from international school, and so there is no necessity for them to learn it”. Another example is from Tomie Cecilia Ishida, who is a teacher of Portuguese language working at Fukushima International Association (FIA). She is also a second-generation Japanese-Brazilian. When she was small, she went to Japanese school in Brazil. The school was built by donations from the first generation, hoping for their children to learn the Japanese language. “There were not many teachers available, so a man from a fish market came for weekdays, and a teacher from a language school only came for weekends. The man from the market was very strict because of his experience in the navy, and the students were taught ‘old’ Japanese culture”. She studied Japanese language there and succeeded in being employed at a Japanese firm. At the age of nineteen, she got married to a Japanese man and moved to Japan together with him. Now she has four children. “Only the eldest daughter can speak a little bit of Portuguese, but none of the others. I wanted them to learn it, but because my husband is Japanese, it was hard to manage it”, she explained. As a result, she is the only one who speaks Portuguese in her family. She confessed, “Now I am teaching Portuguese at FIA, and it helps me by reminding me of my Brazilian identity. I hope that my duties will do some good in anything related with Brazil”. An effective program called the Distant Learning Course aims at providing improved educating condition for Japanese-Brazilians in Japan. It is a teacher training program which started recently, in July, 2009. This four-year E-learning program is held online and scheduled to continue until December 2013. There are 300 places, and applicants must be either teachers who work in Brazilian schools or assistant teachers who instruct Portuguese in a municipality. The course is to improve educators’ ability, so that the educational standard of migrant workers’ children will improve. It also aims at building a cooperative relationship with other institutions and regions by networking Brazilian schools. It is expected to improve the living environment around them and ease the situation. What makes the course more attractive can be explained with two factors. One is that it is basically offered for free, thanks to the financial support from the Brazilian government, the Bank of Brazil, and the Federal University of Mato Grosso (UFMT). The other is that when the course is finished, the students are able to get an official elementary teacher’s license valid in Brazil. It is said that there are more than 300,000 Brazilians living in Japan, and there are over 100 Brazilian schools (Tokai University). However, the tuition fees are quite expensive and facilities are not always good. Moreover, most of them are not official schools, so that although a number of Brazilian teachers in Japan is said to be around 600, most of them do not have a Brazilian teacher’s license (Nikkei Shimbun). Therefore, the Brazilian government set up this Distant Learning Course in order to solve these problems. With its main office at UFMT, it mainly plays three roles; preparation of E-learning teaching materials supervised by the Ministry of Education, operation of remote education, and dispatch of temporary teachers to Japan. Its Japanese office was established at Tokai University. Tokai University is eager to expand its international activities with the establishment of the Head Office of International Affairs (HIAT), which aims at development and coordination of its cosmopolitan relations strategy. It was selected for “Strategic Funds for Establishing International Headquarters in Universities (SIH)” by the Japanese Ministry of Education, Culture, Sports, Science and Technology (MEXT) in 2005. Therefore, with its outstanding contribution to international exchange activities, it became the Japanese office of the Distant Learning Course. It organizes entrance examinations and operates schooling four times a year with backup by MEXT. It also assists interaction among Brazilian schools and local institutions. At a press conference held at the Brazilian Embassy in Japan on February 25, Yasuo Tanaka, the vice-president of Tokai University, stated that he expected to contribute to the program from various aspects with the history of education of foreign exchange students and the information technology of Tokai University. The Distant Learning Course consists of nine semesters, and the students mainly study by themselves at home through the internet. They also attend the schooling sessions. Six major cities of Brazilian migrants, Nagoya, Hamamatsu, Ota, Hikone, Chino and Kani are divided into two groups. The schooling takes place four times a year, and they take lectures and share their learning and experiences. The E-learning curriculum contains various subjects, and students are able to learn from basic subject such as anthropology, sociology and philosophy, and then move to methodology. They also learn the history of the Japanese-Brazilian immigrants and laws related with migration. Lectures about Japanese society, language and culture are also important. The school was originally planned just for Brazilian teachers, but because of the world economic crisis from September of 2008, the qualification requirements were changed. Applicants can now be any nationality, as long as they are proficient in Portuguese and have at least a high-school level educational background. It is also limited to people who belong to a Japanese educational institution and are devoted to Brazilian children’s education. Applicants must take an entrance examination, which consists of two parts. The first part is an online examination which asks about basic knowledge through forty questions on various subjects such as mathematics, history and geography. The second part is an essay test which must be written in Portuguese, requiring high language ability. On July 11, the entrance ceremony took place at the Shonan campus of Tokai University, and 300 students were welcomed. Luis Augusto Castro Neves, the ambassador of the Embassy of the Federative Republic of Brazil in Japan, Maria Lúcia Cavalli Neder, the president of UFMT, and Tatsuro Matsumae, the president of Tokai University attended. President Matsumae stated, “I am hoping that the teachers will be a bridge between Brazil and Japan through this four-year program”. Ambassador Neves also commented, “This project will be a model of educational cooperation between the two countries. I hope that those of you who lead the four-year college life from now will do your best, remaining disciplined and earnest”. An interview with Shigeyo Miyazaki Mizoguchi, a coordinator of the Distant Learning Program at Tokai University, was held on April 9, 2009. She is a third-generation Japanese-Brazilian born in São Paulo in 1946. When she was little, she lived in a colono, a place for settlers, with her family. Colono was naturally set up for immigrants to lead their lives. At the age of nine she moved to the city. Without knowing much Portuguese, she entered a public school. It was offered for free, and the government gave her material aid. She got stationery, soup and medical treatment such as dental care. “It was because the government presumed something about my standard of living by looking at my miserable clothes.” she smiled. She majored in biology and had also been a teacher of junior high school since 1968. This was because university students were often hired temporarily to cover a lack of teachers. Then she got more involved in the field of education. After forty years of experience as educator, including ten years of experience as a principal of a state elementary school in Brazil, she retired and came to Japan. After retirement, she managed her own business, establishing an educational program for Brazilians, and became the secretary-general of the Steiner-Waldorf education association in Brazil for another ten years. Steiner-Waldorf is an educational methodology introduced in the 19th century by an Austrian, Rodolf Steiner. In 2008, she was called by Professor Onuki from the International Department of Tokai University. He was interested in Waldorf education, so he offered her the job. It was an honor for her to get involved in the new educational program among Japanese and Brazilians. Ms. Mizoguchi said that there were two reasons why education of Japanese-Brazilian immigrants began. One is that the children had seen the hardship that their parents were facing. It used to be unnecessary to learn Japanese because the immigrants lived in a colono. However, as they moved to the city and went outside of the Japanese community, it became difficult to learn it. The other reason is that public schools were free of charge. Many parents encouraged their children to study hard, because they thought that once the children entered school, their career and future would be guaranteed. She worries that nowadays migrant children are indifferent to going to school. Brazil in the 1980s encountered devastating inflation, and lots of people including those with high educational background had to work at factories for low payment. As their children saw such reality, they came to think that being a scholar would not help their future. Another problem is that many kids are unconscious about their identities. They can identify themselves as neither Japanese nor Brazilian. She added, “Their parents are also indifferent to their children’s education. My parents were eager to educate me because they wanted me to have a certain identity and roots as a Japanese-Brazilian. However, today parents are just so busy with their own affairs, that sadly enough children are ignored”. Not only children but also parents may have to realize the importance of education. Ms. Mizoguchi said, “There are two types of Japanese-Brazilians, Japan lovers and Japan haters. I must be in between them. I am Brazilian and I do not want to lose that identity, but it is also the fact that firstly I am Japanese. They are completely opposite countries not only geographically, but also culturally. The most important thing is to respect the peculiarities of the two cultures and understand each other. None of them should be destroyed or looked down on”. Brazil is considered less developed in comparison with other major countries, but she responds, “Brazil is made up with various races, and all other countries around the world eventually will be. In that context, Brazil is leading the world, and it shows a great example. This is what Japan should learn”. She concluded, “My mission is to build a bridge between Japan and Brazil”. Her enthusiasm to the mission and responsibility for the Distant Learning Course will surely be a huge step to better educational condition. At the entrance ceremony of the Distance Learning Course, Mitsui & Co., Ltd was given a letter of thanks by President Matsumae for supporting the project. Mitsui has been contributing to the educational program for Japanese-Brazilian children since 2005. 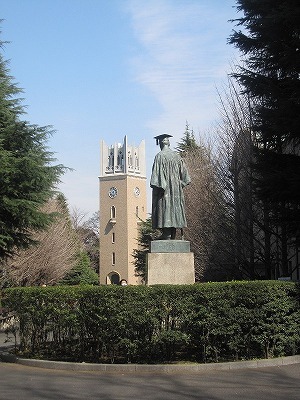 Its main support was to serve educational materials such as stationery and facilities and to invest in lectures about Japanese language and history until last year, but it has currently shifted to the establishment of a scholarship system. It is said that there are 30000 Brazilian children at the age of compulsory education, 5 to 14, and it was estimated that one-third of them go to Brazilian school (Cultural Affairs Agency). However, because of the world economic crisis in September of 2008, many of their parents lost their jobs and cannot afford to let their children continue at school. As a result, many children have to quit, and some schools are closed down. There are some children who go back to Brazil, but others transfer to Japanese public schools. As a matter of fact, transferred children have difficulties with language and adjustment to the new environment. Therefore, considering such a situation, Mitsui decided to shift to financial support, so that children can continue education at Brazilian school. A monthly scholarship of 20,000 yen per person is given to 100 Brazilian students. It is donated to the Brazilian school first, where it replaces their tuition fee. This project is carried out by an Approved NPO, Action for a Better International Community (ABIC). ABIC constantly surveys the situation of the students and their families to remain aware of their needs and to confirm if the system works out well. Mitsui has strong connections with Brazil in various fields, especially in agriculture and the iron and steel industry. Now, it puts importance on solving such a social problem as well in order to develop their partnership. In recent years more and more companies emphasize the importance of Corporate Social Responsibility (CSR). They do not only have economic responsibility but also environmental and social responsibilities, because their activities have great influence especially on developing countries (Kawamura, 2009, 188). Such an approach can become a key to realize a better situation. pagina gerada em 0.1660 segundos.